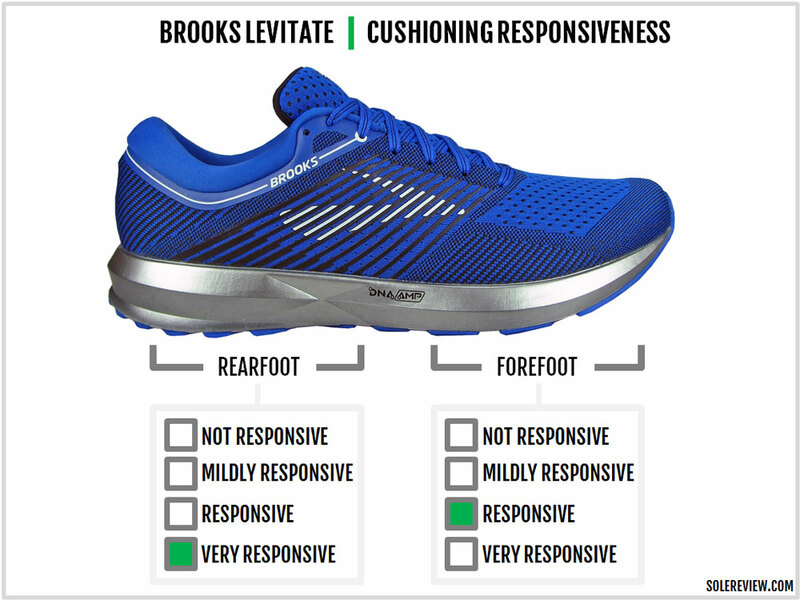 Brooks’ marketing pitch: The most energy return for runners looking for a springy, responsive ride. 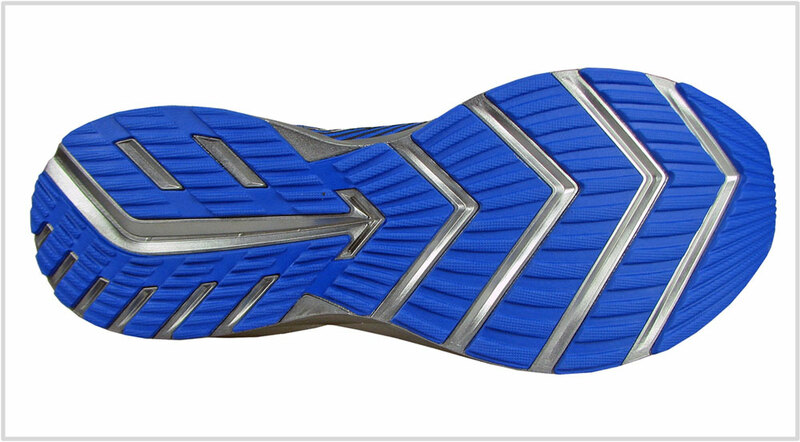 Midsole: Full-length DNA AMP Polyurethane foam. 8 mm heel to toe offset. 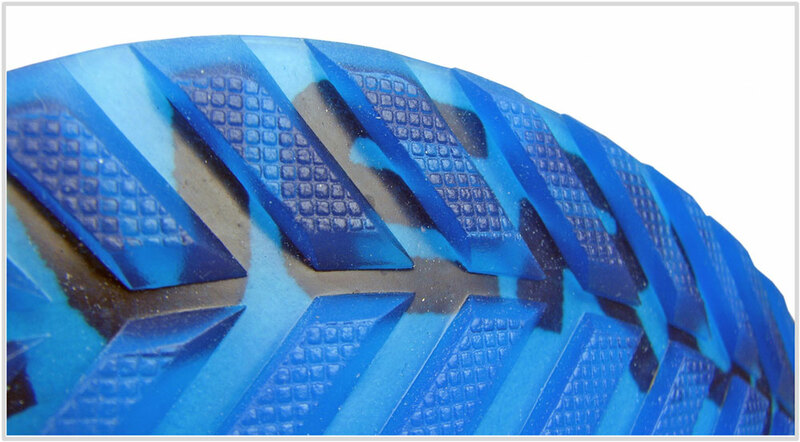 Outsole: Multiple pieces of soft rubber. The Levitate is Brooks’ new neutral trainer with a firm, responsive ride and a snug-fitting knit upper. While the shoe isn't perfect, the DNA AMP platform has plenty of potential. Polyurethane (PU) foam used to be the dominant midsole material during the eighties and the mid-nineties. Back then, compression-molded EVA wasn’t a thing. So the alternative was die-cut EVA (Ethylene Vinyl Acetate) in a blown form – a foam which had the tendency to flatten after 50 miles. PU was heavier but exhibited superior durability properties. Naturally, it became the material of choice for athletic footwear. But as time went by, PU midsoles fell out of favor in the running shoe industry. 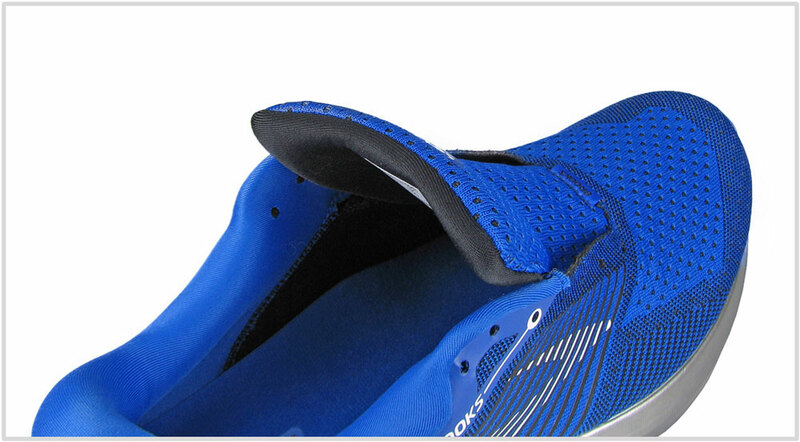 Gradual improvements to the EVA foam helped retain its lightweight cushioning properties for longer. PU was much heavier by comparison, and the foam also suffered from ‘bread-crumbing.’ Polyurethane hydrolysis would cause the shoe to crumble after a couple of years. So for a long time, midsole cushioning was limited to a combination of EVA foam and cushioning inserts such as the Brooks DNA Gel, Mizuno Wave, or the Nike Air. Saucony soon followed with the Everun, an expanded PU variant with firmer cushioning. Other brands such as Puma adopted PU foam, albeit in a different design and formulation. In fact, the composition of the Puma’s Ignite platform is nearly identical to the Brooks DNA-AMP foam. Both these midsoles use a blend of BASF’s proprietary Elastopan light sports material, a PU-based foam. The Puma Ignite combines Elastopan and Cellasto, two of BASF’s elastomeric compounds. 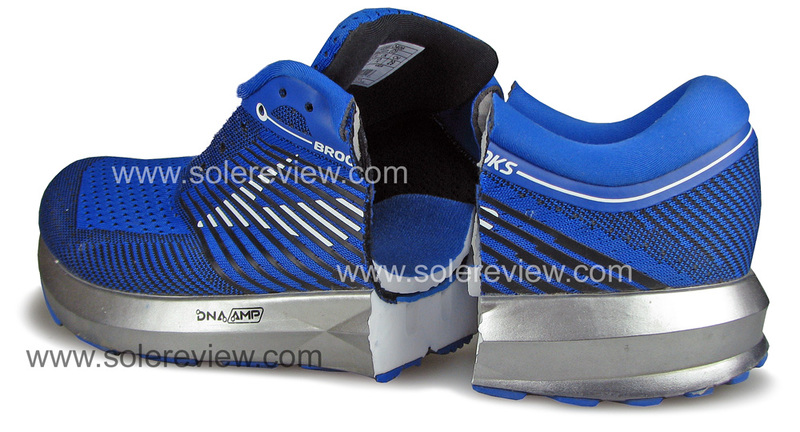 The DNA AMP is Brooks’s marketing name for its midsole. It is made using a BASF PU foam blend which closely resembles the Puma Ignite platform. 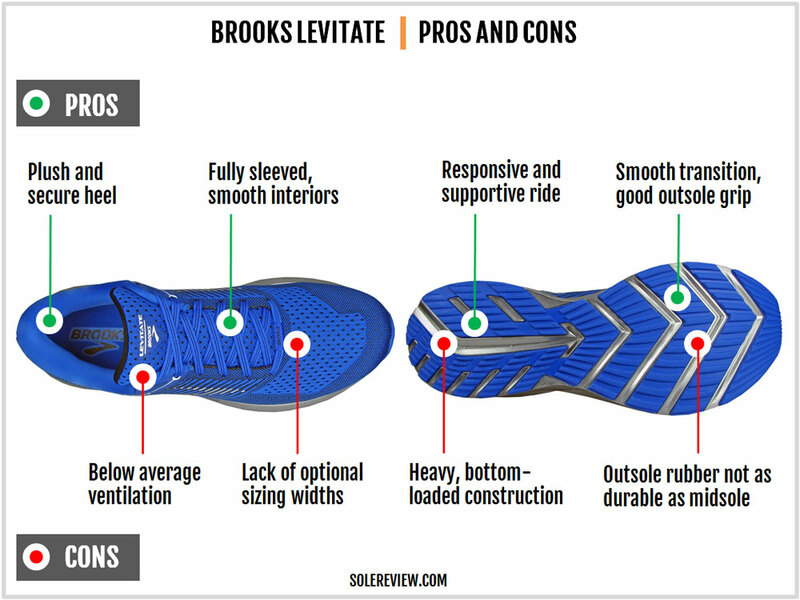 So what is the Brooks Levitate, and more importantly, should you buy it? Trying to slot the Levitate into a single category isn’t as easy as it sounds. The tight upper fit and the firm ride quality reminds us of the Brooks Launch. On the other hand, the Levitate is a much heavier shoe. Ok, so is it a plush neutral cushioning shoe then? The Levitate isn’t that either. It lacks the cushioning plushness of the Brooks Glycerin or the Ghost. And regardless of the BASF connection, DNA AMP’s ride quality has little in common with the adidas Boost or Saucony Everun. Rather, the Puma Ignite is the DNA AMP’s closest living relative. The ambiguity aside, the Levitate is a unique product with lots of potential. Its BASF sourced midsole is extremely responsive. There’s not even a hint of mushiness, and the feeling of ride consistency is second to none. As a consequence, the midsole is very efficient during transitions while being supportive at the same time. The DNA AMP midsole is heavy, and the weight distribution is skewed towards the lower half. The knit upper is lightweight but the Polyurethane midsole isn’t. As a result, the Levitate is 08 grams and 28 grams heavier (per half pair of US 11) than the Triumph ISO 4 and adidas Glide respectively. The Levitate also produces a distinct sensation of vertically-biased cushioning. This means that the compression of the midsole happens in an up-down, two way fashion rather than four-way cushioning which involves horizontal splaying. This is another aspect which takes some time getting used to. As you can see, we have mixed feelings about the Levitate. On one hand, its super-responsive and consistent ride quality is impressive. That is marred by the bottom-loaded weight distribution. And we thought that the Saucony Freedom was bottom-heavy; the Levitate takes it to a whole new level. The Brooks Levitate is an acquired taste. The sensation of heaviness was very pronounced on the first run. By the third run, we had (somewhat) gotten used to the shoe’s weight. If you crave a responsive, consistent, and a supportive ride, then the Levitate has it in spades. As a midsole platform, the DNA AMP has a lot of potential. 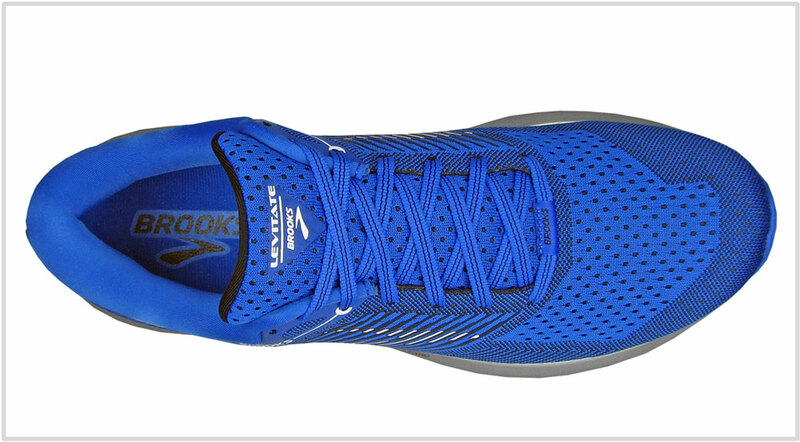 Our opinion is that Brooks could use a thinner AMP midsole and still pack plenty of effective cushioning. For example, a DNA AMP equivalent of an adidas Boston 6 or the Saucony Freedom would make a compelling case for itself. We’re curious to find out what the future brings for Brooks. For example, the adidas Energy was the first shoe based on the Boost platform. While the Energy wasn’t perfect, it laid the foundation for great running shoes such as the adios, Boston, and the Glide. 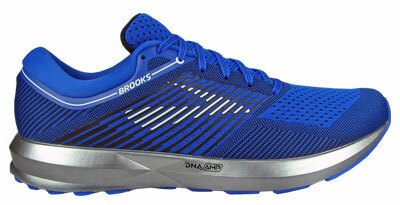 Lastly, the DNA AMP is a new midsole technology for Brooks. When the ‘SuperDNA’ foam debuted in 2014, we cut the shoe to get a better understanding of the material. Needless to say, we’ll do the same today to a lightly-worn Brooks Levitate and show you what’s behind the glossy TPU skin. There goes our $150. Have fun, Y’all. In what’s a notable departure from Brooks’ design tradition, the Levitate uses a single-piece knit upper with a full inner sleeve. Not that this is new to the footwear industry, but it is certainly novel for Brooks. First popularized by Nike, an engineered mesh knit upper is fast becoming the default template for running shoes. The Levitate’s outer upper is a single piece of knit mesh which is joined only by a heel seam. The forefoot seems to be vented while the rest of the upper has a closed texture. Despite the ‘vents,’ the upper isn’t very breathable. The Levitate uses a full sleeve which spans from the midfoot to the toe. In the past, most Brooks shoes stayed away from full sleeves in favor of a partial gusset. As one might expect, the amount of interior space isn’t on the same level as the Ghost, Glycerin, or even the Launch. The Levitate’s upper is sparse on cosmetic details. Apart from the high-density printing over the midfoot and the collar edge, there’s little in way of aesthetic embellishments. Night-time reflectivity? What’s that? That said, all the functional components are in place. The heel has a hard internal counter behind a plush collar. In the front, the engineered mesh toe-box conceals a semi-rigid bumper. And based on our past experience with Brooks running shoes, switching to single-piece knit uppers isn’t a bad idea at all. Historically, Brooks has produced gorgeous looking uppers with lots of layering. But most of them were plagued by assembly problems which not only affected the looks but the fit too. Using fewer components minimizes the risk of finishing issues, so Brooks is headed in the right direction. We’ve covered most of the background on the DNA AMP in our introduction, so we’ll just focus on the construction here. Unlike the adidas Boost or Saucony Everun material which is made using a colony of fused globes, the DNA AMP is formed when molten Polyurethane foam is injected into a mold. This process is identical to the production of the Puma Ignite as well. This method makes the midsole quite dense and the ride quality firm. 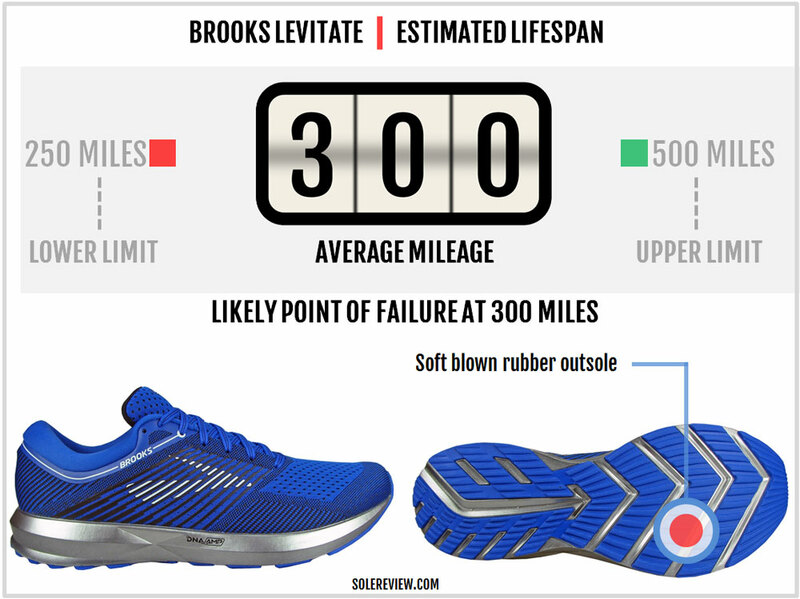 This also explains why the Levitate is heavier than the Saucony Triumph and the adidas Glide Boost. 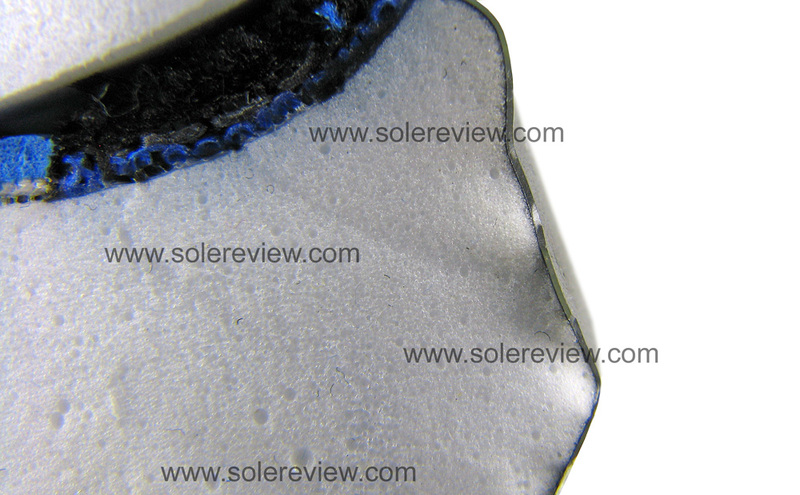 Inside the TPU skin, the entire midsole is single-density from heel to toe. Since the uncoated PU foam has a porous texture, Brooks coats the midsole with another layer of TPU. 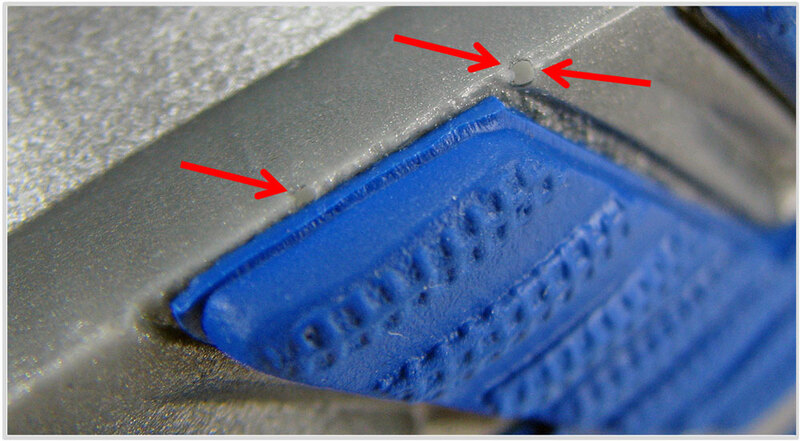 You can see a pocket or two of the ‘PU foam bubbles’ near the outsole edge where the TPU film isn’t as thick. Apart from giving the sidewall a glossed texture, this film also prevents the midsole from splaying (sideways) too much. This gives the Levitate a compression quality which is vertically biased. Here’s a cross-section of the DNA AMP midsole where you can see the white portion (DNA AMP) behind the silver layer. The TPU film isn’t paint; it is chemically bonded to the midsole. When poked with a finger, the white foam inside is softer than the outer midsole. So the TPU film plays a significant role in how the midsole behaves. By the way, the holes you see in the center of the cross section are created by the PU mold. In its stock form, the Leviate midsole has a large number of these holes. The outsole is split into many Chevron-shaped lugs. One would assume that the Levitate is insanely flexible due to all the grooves, but that isn’t so. The DNA AMP midsole is dense with a thick stack, thus making the forefoot stiff. 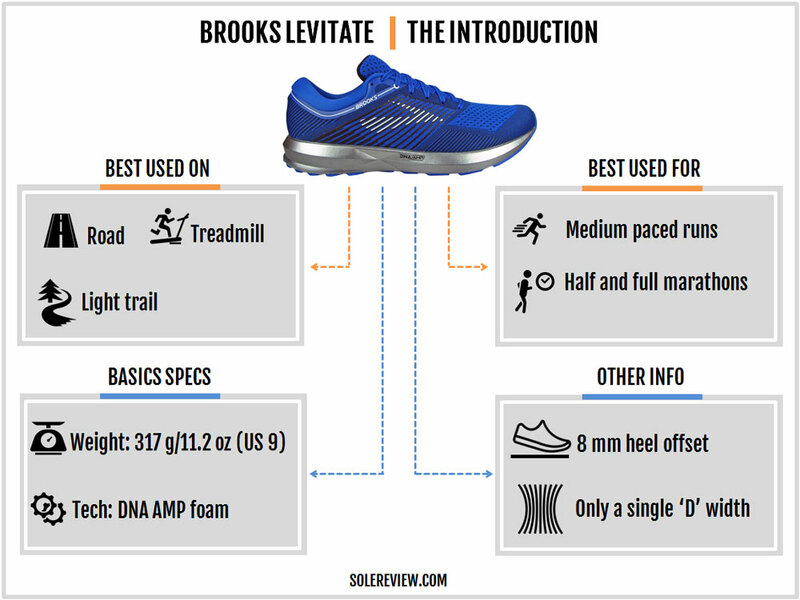 Like most Brooks running shoes, the Levitate has a durable upper and midsole. The DNA AMP’s chemical formulation makes it impervious (we stand corrected, see update below) to fatigue and cushioning loss. 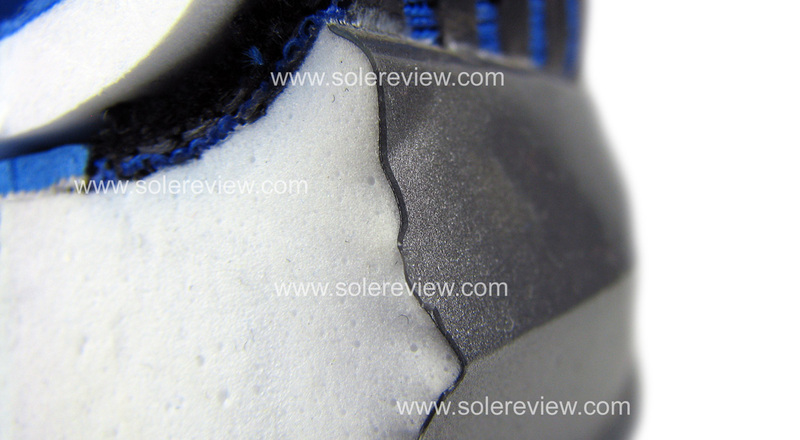 You’ll also see none of the sidewall creasing or eventual deformation which happens in EVA foam midsoles. The silver gloss on the sidewall is another layer of Polyurethane. It is unlikely that it will be delaminate like ordinary paint unless you manage to put a deep gash on the side. The outsole is the Levitate’s weakest point. 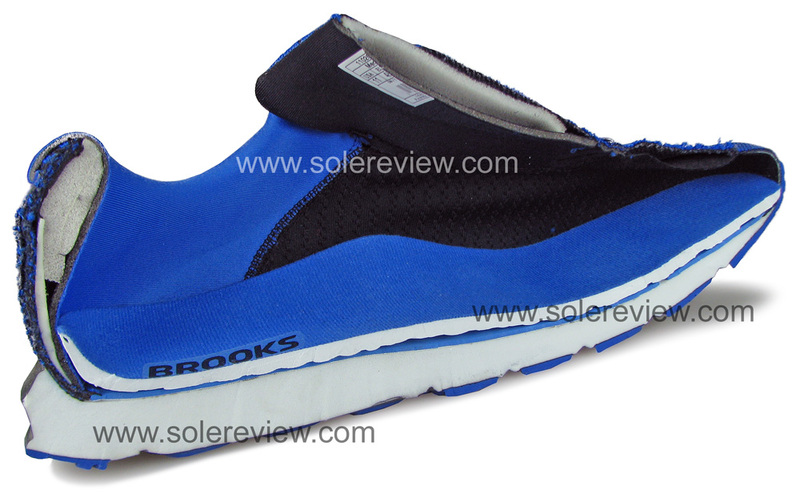 Brooks uses thin slabs of its familiar soft rubber compound. As a result, the outsole will be the first part to wear. It’s high time Brooks found a more durable outsole material to complement its DNA AMP midsole. Like adidas’s Continental rubber or Saucony’s Ice rubber for example. At first, we thought that the Brooks Levitate fits a half size small. After a few runs, we realized that it was the narrow toe-box which had led to that impression. The toe-box is noticeably snug on the big-toe side. With the toe hemmed in, the sizing feels smaller than its actual size. Blame it on the midsole; its front end is pointy and affects the toe-box fit. So this is more of a midsole issue than a last one. The upper fit is narrow because the Levitate uses a full inner sleeve. The gloved construction of the shoe reduces the overall interior space. The toe-box height isn’t shallow but there isn’t any margin above the toes either. We recommend that you go true to size in the Levitate. Unless you want Brooks Glycerin or Ghost levels of toe-box room, that is. Except for the heavily quilted heel collar, the rest of the Levitate’s upper has a utilitarian feel. The interior environment lacks the plushness of shoes like the Glycerin. While the fabric lining is soft, the outer mesh isn’t stretchable or adjusting in nature. Also, the tongue has minimal padding. The upper runs warm due to the double-layered mesh. The semi-stretch laces are slightly short too. The Levitate isn’t a plush shoe, nor is it lightweight. Some runners might assume that the BASF sourced midsole will be somewhat similar to Saucony Everun or the Boost. Nothing could be further from the truth. The DNA AMP uses a higher density material and a TPU skin which resists compression and reduces softness. On the other hand, if you have experience running in the Puma Ignite, then you’ll feel right at home. The Levitate has a firm ride character throughout. 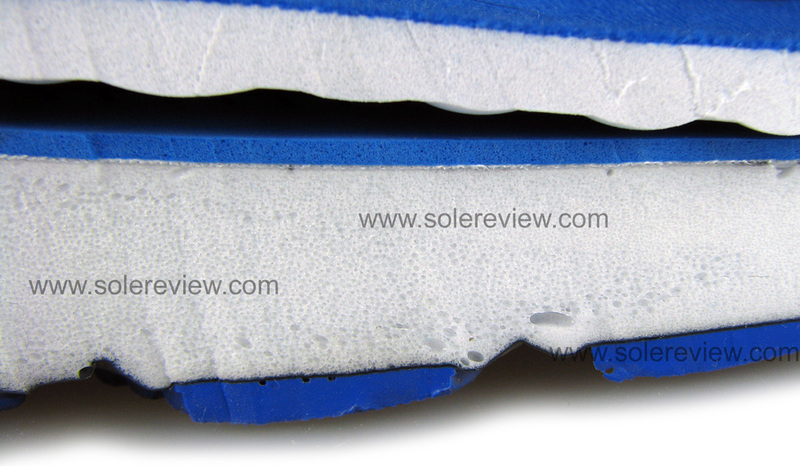 The only superficial softness is provided by the thick EVA foam insole. There are a few things unique to the Levitate. The cushioning is vertically biased. In plain English, the cushioning is delivered in an up-down motion rather than splaying sideways. This is due to the TPU skin over the sidewalls. The silver ‘skin’ prevents the foam from flattening on the sides. The Levitate is also extremely responsive, very springy, but again the rebound action happens in a vertical fashion. The much firmer outer skin ‘contains’ the responsive cushioning within its boundaries. Most runners will not be accustomed to this unique behavioral trait and hence won’t know what to make of the Levitate at first. Also, the shoe is noticeably bottom-loaded in heaviness. Needless to say, many people will take a week of running to decide whether they like the Levitate. Or not. 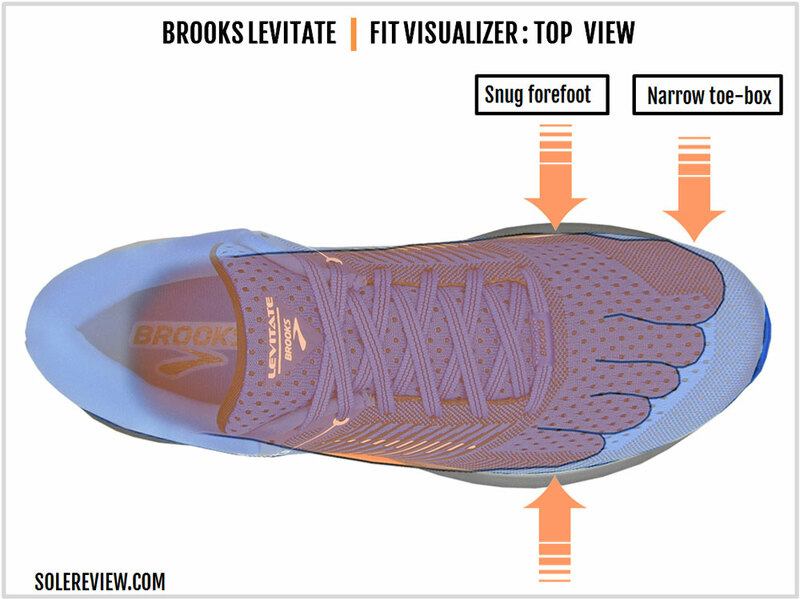 Like we said – the Brooks Levitate is an acquired taste. Ok, here’s another thing you should keep in mind. While the Levitate’s published heel drop is 8 mm, it feels like 10-12 mm. This isn’t Levitate’s fault but rather due to how other running shoes typically behave. Some running shoes have a softer heel, so an 8 mm drop isn’t actually 8 mm. With weight loading, the dynamic (actual) offset turns into 4-6 mm. The Levitate’s firm midsole doesn’t compress a lot to begin with. And when it does compress, the DNA AMP rebounds so fast as if the compression never happened. To sum up, the Levitate is one of those rare running shoes where the dynamic heel drop numbers will be a close match to the published number. That is why we always tell you to take the ‘heel drop’ with a large grain of salt. Considering the midsole’s vertically-biased cushioning, the Levitate is very neutral and supportive. 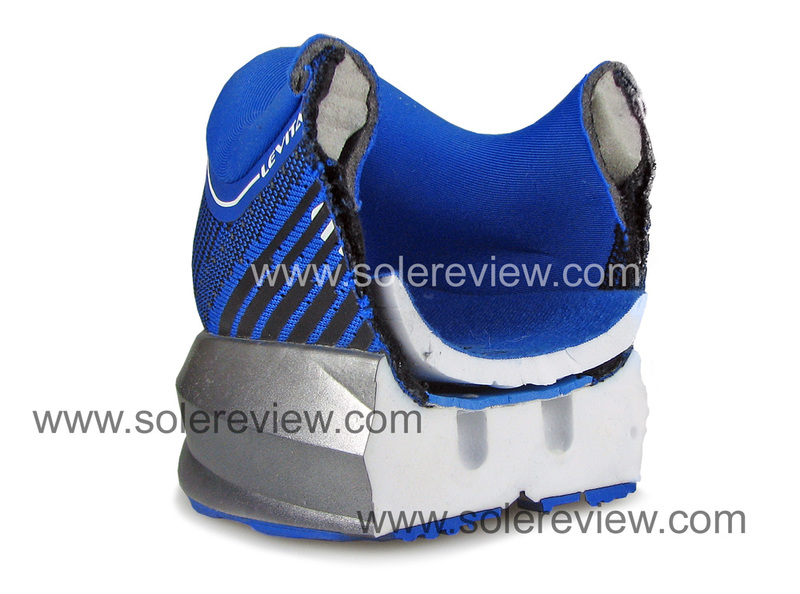 The midsole compression does not favor any side; the ride behavior is very balanced. The firmness and responsiveness also produce quick transitions. Cushioning and softness are not mutually inclusive. In that sense, the Levitate is very well cushioned but not soft. The thick midsole provides deep cushioning with a snappy ride. 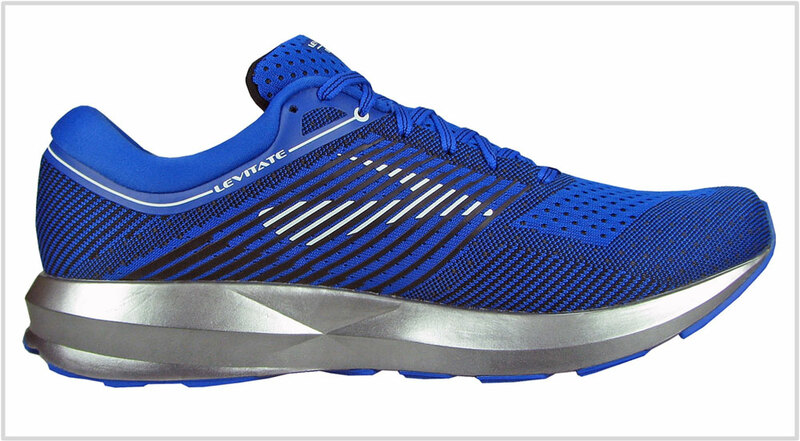 As a firm and supportive trainer, the Levitate will also appeal to heavier runners. Ideally, the Levitate’s ride and upper fit quality would have made it suitable for fast training runs. But its 11 Oz+ weight holds it back; there’s a definite heaviness in the lower part of the shoe. The same heaviness could be a bother during longer runs. As one of our readers mentioned in his review, the Levitate does ok up to runs of 10 kilometers. But once you cross that threshold, the shoe’s bottom-heaviness becomes apparent in a tiresome way. Personal experiences will differ from runner to runner, but there’s no denying the fact that the Levitate is a heavy shoe. We’ll give credit where it is due. 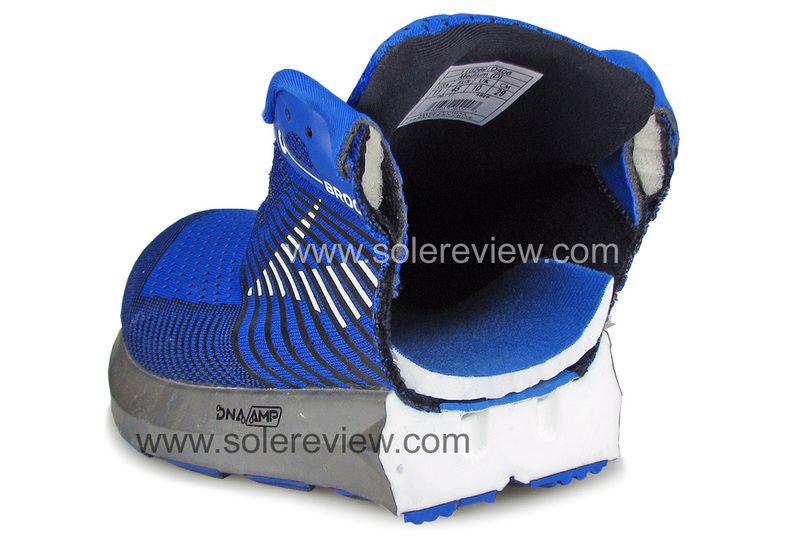 The DNA AMP is an example of high-quality cushioning. It is supportive, superbly responsive and efficient. Which begs the question – does the midsole need to be this thick? We’re pretty certain that a Levitate with a thinner midsole will be a lighter and better shoe without sacrificing impact protection. For example, the Puma Ignite uses a similar midsole material (without the TPU skin) but does not feel as bottom-loaded. That’s because the Ignite uses a midsole with lower stack heights. Despite some of its idiosyncrasies, the Brooks DNA AMP is no hype. It shows great promise as a future launchpad for all upcoming Brooks products. However, the Levitate isn’t a shoe you take a liking to immediately. Its firm, vertical cushioning and bottom-biased weight distribution isn’t going to appeal to everyone. The Levitate has a very responsive ride. We’ll go as far to say that the midsole is the springiest (if that’s a word) in its weight and cushioning class. The ride is medium-soft bordering on firm, and that’s one of the reasons which makes the shoe supportive and efficient. In what’s a rare occurrence, Brooks uses a full inner sleeve. This helps smooth the interiors while providing a secure fit. Inadequate ventilation is one of the drawbacks, and the failure to offer additional widths is another. This is particularly relevant given the Levitate’s tight upper fit. Among other negatives, the quick-shredding outsole is a gross mismatch with the ultra-durable DNA AMP midsole. The weight distribution is bottom-heavy, and this will bother a few runners. Lastly, this $150 MSRP shoe has zero reflectivity which is not ideal for sunless winters. 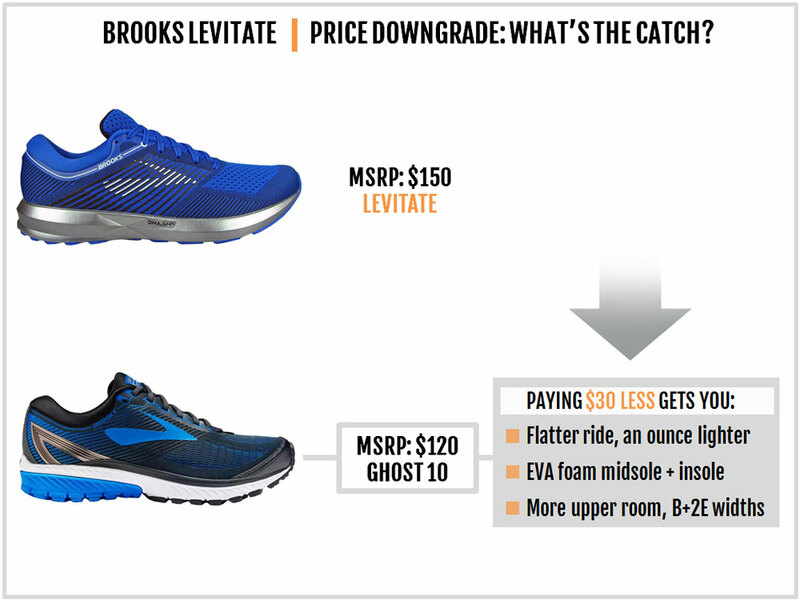 The Brooks Ghost 10 isn’t exactly what you call a functional downgrade from the Levitate. Instead, look at it as a lower-priced alternative. It’s a good buy for $30 less if you want a softer and lighter shoe with a comparatively relaxed forefoot fit. The Ghost also comes in a B (narrow) and a 2E (wide) too. 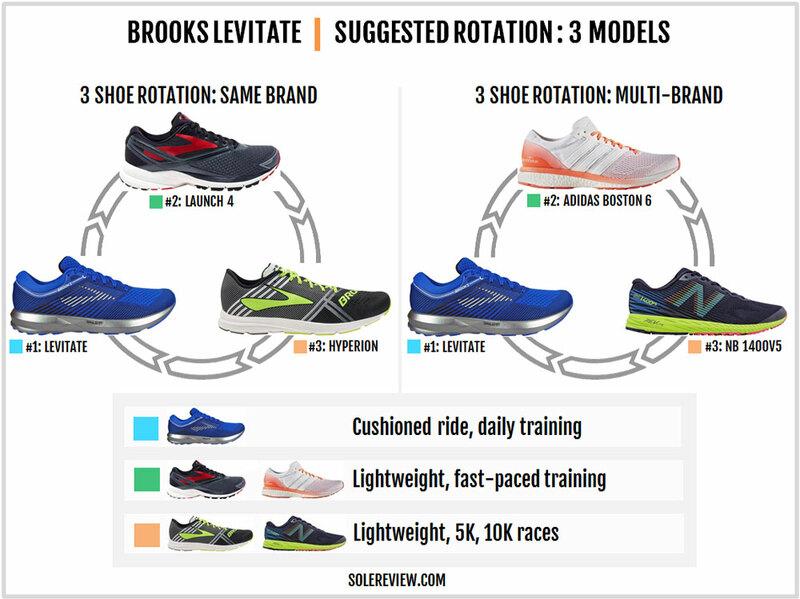 Picking a rotational shoe for speed-runs is easy. Brooks sells the lightweight Hyperion for short 5K and 10K races. Else, you have the dependable New Balance 1400V5. When it comes to a third shoe meant for fast training runs, there are plenty of options outside Brooks. Our pick is the adidas Boston 6. It is a cushioned and relatively lightweight trainer which complements the Levitate. 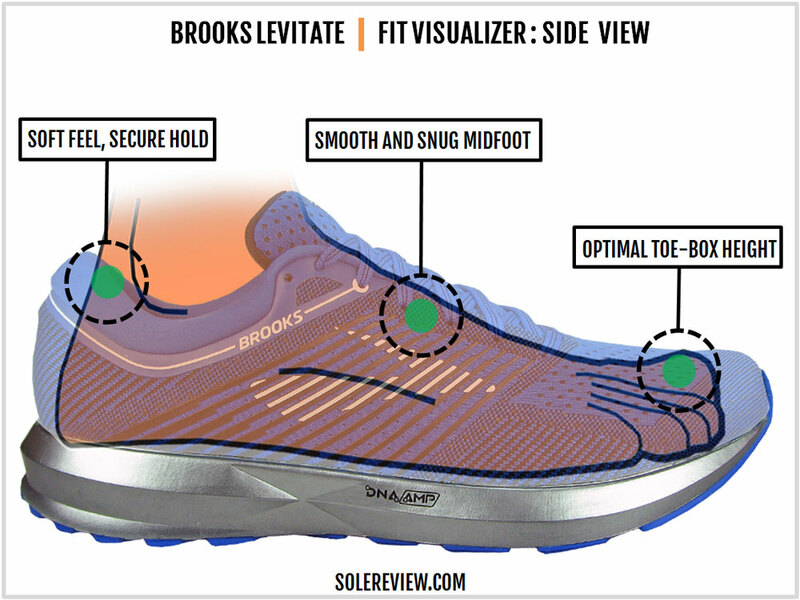 Though there are fast trainers such as the Launch within Brooks, there’s a bit of overlap (with the Levitate) in the ride and fit department. We suggest a three shoe rotation consisting of the Levitate, the adidas Boston, and the Hyperion or the New Balance 1400V5. We said at the beginning that it was hard to slot the Brooks Levitate into a specific category. 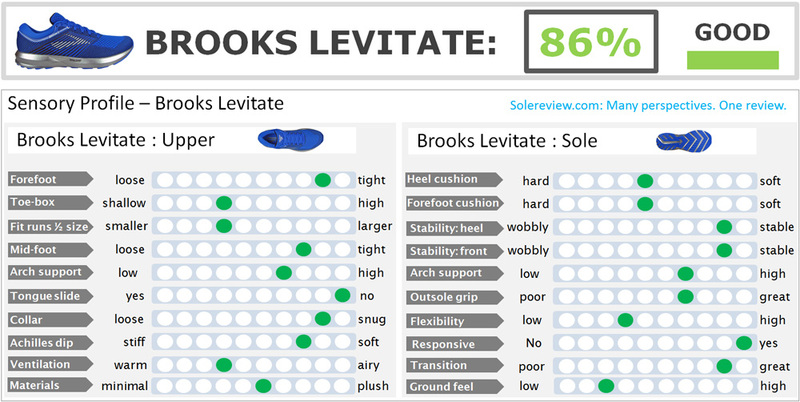 However, for comparison sake, let’s give the Levitate a premium neutral cushioning classification. Readers will be interested to know how the Levitate compares to the Triumph ISO 4 and the adidas Supernova. The Levitate has a firmer ride than both; the adidas Supernova is significantly softer while the Triumph ISO 4 is somewhere in between. When it comes to efficient responsiveness, the Levitate outperforms the other two. The Supernova has a more relaxed upper fit than the Triumph and the Levitate. With its full inner sleeve, the Brooks shoe fits the narrowest of the three. The Levitate outweighs the other two shoes by a noticeable margin. It packs 28 gms and 8 gms more weight than the Supernova and the Triumph respectively, and most of the weight is due to the midsole. There are other popular neutral trainers like the Asics Nimbus 19 and the New Balance 1080 V7. 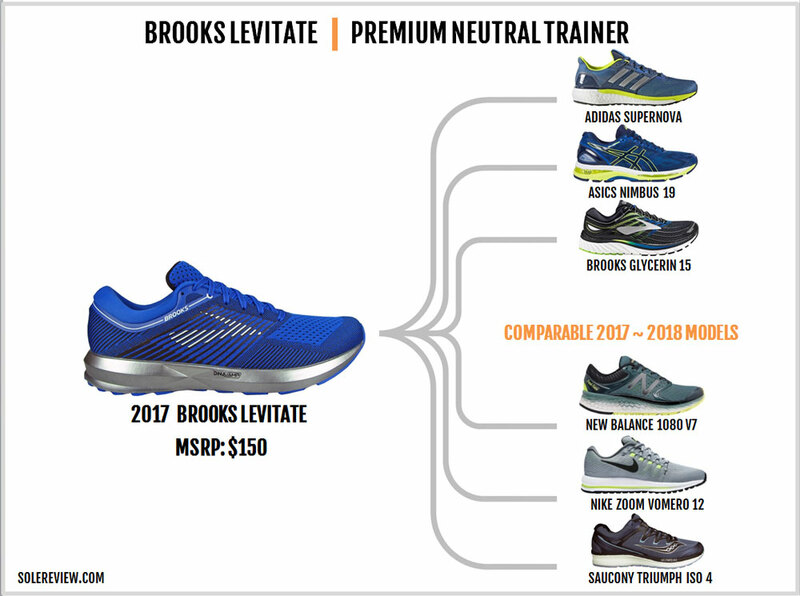 Just remember that the Brooks Levitate doesn’t offer the ride plushness usually expected of a premium neutral trainer. If it is cushioning softness you’re looking for, you’ll find that in the adidas Supernova, the Brooks Glycerin 15, or the Nike Vomero 12.